When you talk about productivity as much as I do, people want to know what my favorite tools are. 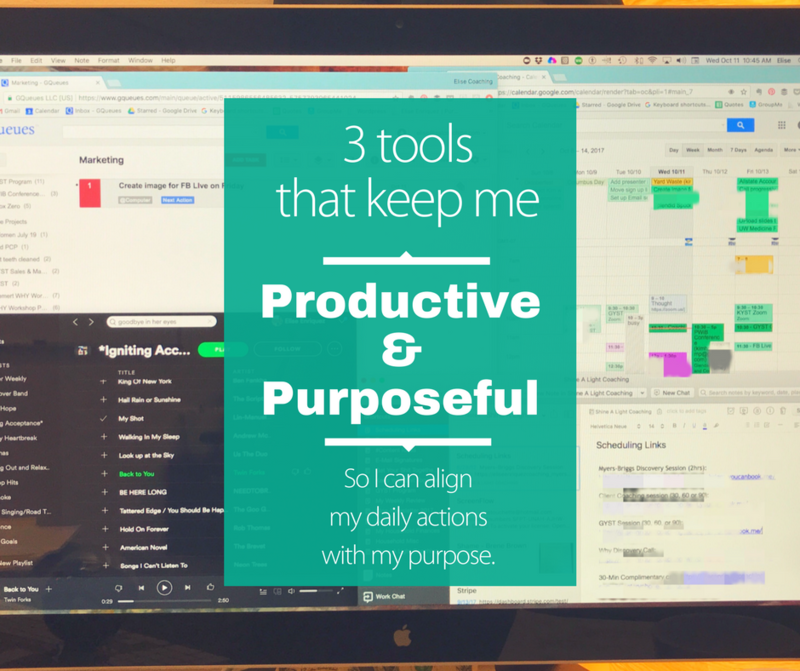 So I’m going to share the three tools that keep me productive and on purpose. But first, a little bit more about what it means to be productive and on purpose. It’s all about aligning your daily actions with your higher life’s purpose. Aligning the ground level of daily life with the 30,000 foot level of who you want to be in the world and the kind of impact you want to have. In order to align your day-to-day actions with your purpose, you have to be intentional. The struggle that most of us face is that day-to-day life can lead us to be very, very reactive. Whether it’s e-mails that are coming in, phone calls, texts, requests from people in our lives, whatever it might be, real life, real day-to-day life gives us every opportunity possible to be reactive, when, in order to live life in line with our purpose, we actually need to be more intentional. This reactivity also leads to a sense of busyness, right? From the outside looking in busy can look like a good thing. But busyness is just that, an external measurement. It’s something that people can see and maybe be impressed by but it doesn’t always lead to feeling good about what you got done at the end of the day. What most of us are really looking for is productivity. Feeling productive is more of an internal measurement. It’s more about, did I get done the things that I wanted to get done today? Did I get done the things that I care most about? Did I move forward those things that are most important to me and are they aligned with my higher level purpose? TO foster understanding and acceptance of self and others SO THAT we can come together to make the world a better place. Everything I’m trying to do on a day-to-day basis aligns with that. I’m not always on purpose. Sometimes, I’m reactive. But overall, the work that I’m doing, even when I’m doing a task I don’t like to do, is worth doing to me. As long as it aligns with my purpose. I want to help YOU be more productive and less busy. Here are the three tools that help me do just that. I literally have these 3 tools open on my second monitor at my office at all times. These are the tools that help keep me productive and on purpose. The first tool I go to at all times is my calendar. Why? Because my calendar shows me what my day is going to look like. It is the hard landscape of my day. What do I mean by hard landscape? In a yard the hardscape is any of the non-living stuff that is part of the design. Decks, sidewalks, retaining walls, etc. They aren’t easily moveable. They are committed to. That’s how appointments are on my calendar. They are the commitments I’ve made. The only things that go into my calendar are actual appointments. On occasion I sometimes have to block off time on my calendar so that people can’t book me if I need to work on a project or I block off travel time, but other than that my calendar is for appointments only. So my calendar shows me when I can’t be working on anything else because I’m either in an appointment or traveling to an appointment. The calendar not only shows me where I need to be and when and with who, but it also shows me how much time I have in my day to do anything else at all. Those blank spots on my calendar are the times when I can get the rest of my work done. Part of my work as a coach is appointments with my clients, actually being in a session with them but there’s lots of work outside of that that needs to get done. So, those blank spots on my calendar tell me when I’m going to be able to do that work. 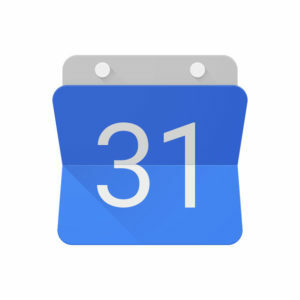 While I happen to use a Google calendar, it doesn’t really matter what app you use for your calendar. What matters is that you have a calendar that you can trust. A trusted calendar is one that has every appointment on it. If you have a calendar for your personal life, a calendar for work, etc, I highly recommend getting all of your calendars in one place so that when you look at your calendar, you can trust it. Not being able to trust your calendar is like having no calendar at all. I use GQueues to manage projects and tasks. The second tool I have open at all times is GQueues. GQueues is a project and task management tool. How do I use it? Let’s say I wrapped up a coaching session at 10:30am. I have 30 minutes to get something done before my next appointment. GQueues is the place that I go to help me see what I could be working on when I’m not in appointments. GQueues is where I plan my work. GQueues is really just a bunch of categories (folders) and queues (lists) with tagging functions that allow for customized searches. Categories, queues and tags, that’s it. But I’d be lost without it. Basically, you can have a bunch of different categories like: home, work, kids, someday/maybe, etc. Within a category, you can have queues. In my GQueues I have a queue for every project I currently have underway. Within each of those queues, I can have a list of tasks for each of those projects. What’s powerful about GQueues is not only does it allow me to know what I could be working on when I have time but it also allows me to get everything out of my head. Just like I don’t count on myself to remember who I’m meeting and when at what time (I use a calendar for that) I use GQueues to help me remember what are all the projects I’m working on and what’s the next action I need to take to move that project forward. I absolutely count on GQueues for that. I also use it to capture any fleeting thought that comes through my head. If I have a “I have to remember to…” thought, I just pop it into the GQueues app on my phone and then decide how important that thought was when I get back to my desk and have time to think. Then I toss that “task” into the right queue and tag it appropriately. The other cool thing about GQueues is the tagging feature. 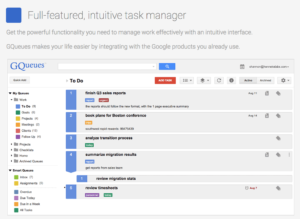 You can create custom tags to that a make your tasks searchable in a more useful way. The way I tag my tasks is according to context. For me, context is the place I need to be to do that task. So, back to my earlier example, when I have 30 minutes before my next client and am at the office, I can go to saved search list called “@Office” and see all of the tasks that have the “@Office” tag on it. That way I can only see the tasks that can actually be done at the office. I have a tag called “@Errands” so that whenever I’m out running errands, I can just click on my “@Errands” list and see anything I could tackle while I’m out and about. My other favorite tag that I have is called “@Couch Browsing”. This is the tag I use for things that I could be doing while I’m sitting on the couch watching The Voice or some other mindless TV. A lot of other systems can help you manage tasks and lists but a lot of them don’t allow you to slice and dice your tasks the way that GQueues does. What I love about GQueues is that the tags feature allows you to think about WHERE you are and what you can get done in that setting. Otherwise you are just looking at a big long list of tasks and then find the ones you can actually do in the setting you are currently in. GQueues uses tags to do that filtering for you. GQueues is also the tool that helps me get my all of my email inboxes to zero every single Friday. While many of my emails get dealt with throughout the week, there are inevitably some stragglers still in my inbox on Fridays. They are there because I haven’t taken the time to determine what has to happen with them, if anything. So, on Fridays I look at each one of those remaining e-mails to determine what the next action is for that e-mail. I then put that next action into GQueues as a task and that e-mail can either get archived, filed or deleted. Boom! Inbox ZERO! You can download my free guide to help you get your inbox to zero by clicking here. Evernote is my repository of non-actionable information. The third tool that I have open at all times at the office is Evernote. My calendar and GQueues hold everything I’ve decided is important that I have to DO. They are all about productivity. Things don’t go in there unless they are actionable. So those tools keep me focused on the things I want to be working on and things I want moving forward. Evernote is where I hold everything else. I keep things there so I don’t have to hold them in my brain. Just like I don’t try to remember all my appointments and I don’t try to remember all my projects and tasks because my brain is not meant for that. It’s not meant for holding ideas. It’s meant for having them. Again, Evernote holds everything else. It holds ideas for me. It holds every single account that I have a login for. It holds a list of all the links that I send the clients on a regular basis. It holds ideas I have for blog posts. Evernote is basically a bunch of highly searchable electronic notebooks and notes. It can even search handwritten notes that you’ve uploaded. Cool, right? Evernote is my repository of information that I need to run my life and my business. Evernote also makes it so that I never have to type the same email more than once. If I send an important email to one client and it’s something I know I’m going to have to send again, I copy that e-mail, toss it into Evernote so I have it for next time I have to send a similar message. I actually shared a bonus tool in my Facebook Live video on this topic. Watch the video below to find out what it is. My 3 favorite tools to keep me productive and focused. 1. A calendar I trust…it only holds appointments, but it holds ALL of my appointments. 2. GQueues…to help me know WHAT tasks and projects I could be working on depending on WHERE I am. 3. Evernote…to hold the non-actionable information I need to run my life and business. All of these support my life+work productivity system that is customized to me and what I care about most. Tell me, what tools do you use to keep you productive and on purpose? If you want to learn how to create your own life+work productivity system that you’ll actually use, go here. 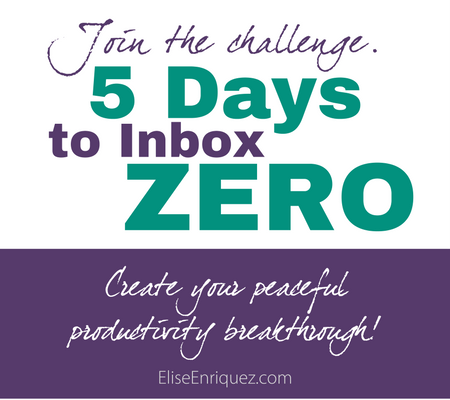 If you want to join the 5 days to inbox zero challenge go here.